This weekend I am off to The Ella Sharp Museum in Jackson, Michigan for the Michigan Watercolor Society Exhibition. 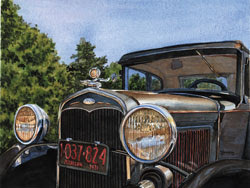 The image at right, 1931 Ford, was accepted into the show by the juror, Ellen Murray. Awards will be announced at the opening reception on Sunday. As Awards Chairperson for the society I have handled keeping track of the donations for awards (a BIG job!). I am excited to see which of the 70 wonderful pieces will receive awards. If you are in the area, please stop by, see the show and say hello! The artwork entered this year is outstanding. Museum open Tues.-Fri. 10am-4pm; Sat. & Sun. 11am-4pm.